Single Incision Gallbladder Surgery — Good for Me? Home → Single Incision Gallbladder Surgery — Good for Me? An estimated 1.2 million gallbladder removal surgeries are performed in the United States annually. The majority of these are performed laparoscopically, with the surgeon making only a small keyhole incision through which to work. As of April 2012, using techniques pioneered by Dr. Huy Nguyen in San Jose, California, surgeons are able to perform gallbladder removal surgery (technically known as a cholecystectomy) using the Intuitive da Vinci® Robotic Surgical System. The gallbladder is a very small pouch located in the upper right hand portion of the abdomen beneath the liver. Bile is stored in this pear-shaped pouch for release into the intestine as part of the process of digestion. 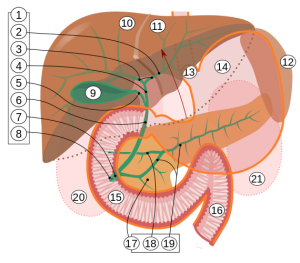 Bile is a bitter liquid produced by the liver. Normally gallbladders function well, but sometimes gallstones develop. These are small, hard stones that can develop within the gallbladder and block the duct through which the bile enters the intestine. Pain, jaundice (yellowed skin), and fever can result from blockage of the bile duct by gallstones. Treatment of gallstones ranges from medications to dissolve them, surgery to remove the stones themselves, ultrasound to break them up so they pass naturally, or removal of the gallbladder entirely. Since life without a gallbladder is relatively easy, the final option is commonly chosen. Surgical techniques for gallbladder removal include open abdominal surgery, laparoscopic keyhole surgery, and single incision robotic surgery. The latter option results in minimal scarring, reduced levels of pain, less blood loss, faster recovery and shorter hospital stays. Quality of care, safety and patient satisfaction are all enhanced. Fear not, the robots aren’t taking over the world yet! In single incision robotic surgery, the doctor sits at a console in the operating room. The console provides 3-D, high-definition images of what is happening inside the patient’s body. Using controls located beneath the display console, the equipment translates the doctor’s hand, wrist and finger movements into precise, real-time movements of the instruments inside the patient. Miniaturized surgical instruments are inserted into the patient’s abdomen using a single incision through the belly button. Fiber optic technology and video monitoring equipment allow surgeons to perform procedures with far less disturbance of surrounding tissues and structures. Are all Laparoscopic Gallbladder Removal Surgeries Performed Through a Single Incision? No. The majority of gallbladder removal surgeries are currently performed laparoscopically, but with multiple incisions. The surgical instruments are inserted into separate incisions to provide access to various parts of the abdomen. The new technique pioneered by Dr. Nguyen utilizes improved robotic instruments that can enter the abdomen through one incision and still move in three dimensions while inside the body. It is estimated that single-port surgery could be used for 80 percent of elective gallbladder removal surgeries. Single incision robotic surgery offers significant improvements over even traditional laparoscopic techniques. The surgery normally takes less than one hour and patient time in the hospital can be as short as two hours. Pain and bleeding are reduced. Time lost from family and work are minimized. And in terms of cosmetic results, evidence of the surgery is hidden within the belly button!